Time Vacation is a progressive company that offers people the chance to see history with a vacation through time. The most popular locations, dinosaurs, pyramid building, and the American Revolution bring in thousands of people a year, paying the million dollar price tag for the chance to see history come to life all thanks to the inventors of time travel, the late Daniel Blank, his son Maximilian, and Max’s late wife, Sarah. 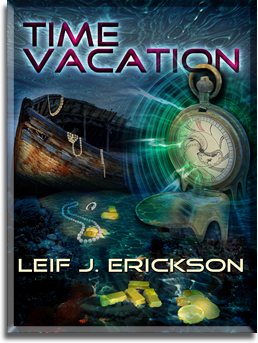 Although Maximilian has sworn to never enter the time travel system again after his father and wife died traveling through time, a death that he witnessed and was powerless to prevent, a death that he’s tried to rectify, a death that haunts him every day, when Time Vacation is taken over by treasure hunters with a mercenary army, the FBI attempts to recruit Max to help them. Max resists at first until he learns that the treasure hunters had hired a historian to come with them, Becca Baxter, his late wife’s sister. Not wanting to face his parents-in-law after losing another one of their daughters in time, Max puts a team together to rescue Becca and bring the treasure hunters to justice. The rescue team has to dodge time jumps which brings them to all sorts of different times, while trying to track down the treasure hunters. When Max’s team is finally able to track down the treasure hunters, the hunters try everything to escape the law but when people start dying in unexplainable ways, the two groups realize that the only way they’re getting home is working together. As Max worries about losing the time door, and the ability to return home, the group discovers that there was more behind the takeover of the company than people realized. Can Max save Becca, his team, and time itself or will his past come back to haunt him one more time?